We get some many questions on a daily basis from participants in our classes and from the general public about exercise for older adults. So, for today’s blog post we’re putting some of our most asked questions to our Development Officer/Senior Physical Trainer Paul Kirwan. I’m over 66, why should I exercise, that’s for young people? Exercise helps to keep you independent! It can help you move better, feel better and be able to get out and socialise more. Think about bringing your shopping in from the car; exercise helps to strengthen and protect your muscles so you can continue to do everyday tasks like this and not depend on others to help you. What type of exercises are the best for older people? All types of exercise are good for older adults once they are specific to your goals. As you get older you loose muscle mass at a faster rate than when you were younger, so it’s important to do resistance exercises to counteract that. Resistant exercise are those where you use more than just body weight, for example incorporating light weights or resistance bands. These typically should be performed twice a week. Cardiovascular exercise helps you to be able to move for a longer duration, for example being able to clean the house or walking to meet a friend for coffee without having to take regular breaks. The World Health Organisation recommends 150 minutes of exercise per week or 30 minutes per day over 5 days. This should be a mix of cardiovascular exercise such as walking and at least two resistance workouts per week. If you’ve never exercises before, I recommend starting off slowly and working up to this goal, try going for a 15 minute walk and working up to 30 minutes or doing two walks and one resistance workout per week and slowing increasing. Taking is slow and introducing your body to exercise will help you to create good habits that you will be able to stick to. I walk nearly everyday, surely that’s enough? Although walking is an excellent source of free, accessible exercises, it’s not enough to improve strength in the upper body, issues around balance and depending on the speed and the distance of your walk with determine if it’s actually having a benefit. Try incorporating at least one resistance workout, even from your sofa while watching the news to help keep your strength up. You don’t necessarily need to lift weights right off the bat. You can simply do the movement without any weight and work up to introducing weights or resistance bands. 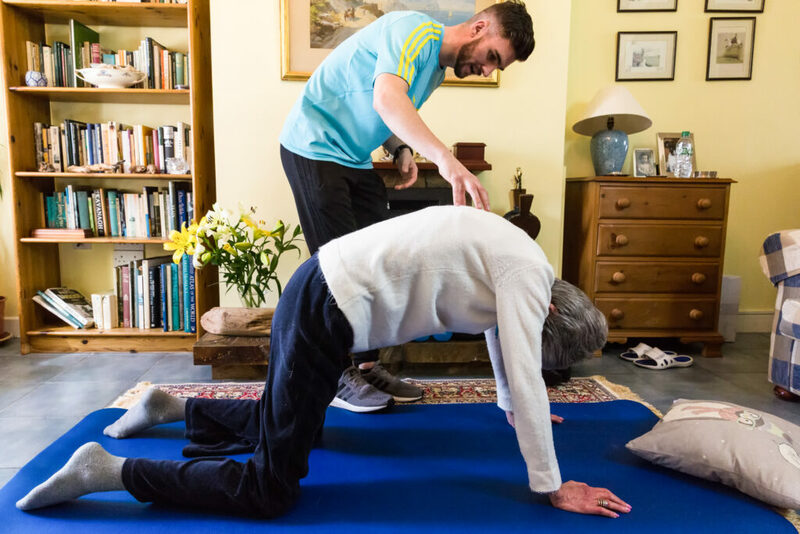 It’s a good idea to speak to a health professional such as a physiotherapist or a physical trainer to ask about the best exercises for you if you’re concerned about frailty. It’s good to bear in mind, numerous studies have shown that resistance exercise helps to build strength in the muscles and bones. If you have any questions you’d like answered, why not leave them in the comments section and they may be featured in a post soon. Why not try our Free At Home Exercise Guides to start your exercise journey or see if there’s an exercise class near you.